We are planning an event/happening to highlight the fact that the planned Doncaster railway has been a long time coming. This Saturday we will be reminding shoppers at the Westfield Doncaster centre that the railway was first proposed in 1880. Dressed in Victorian costumes, we’ll be milling around and queuing in unlikely places. Why? We’re waiting for the train! It has had 127 years to get here, so we know it must be arriving soon! Manningham is the only Melbourne municipality without a train or a tram service. A 2012 study led by Curtin University’s Peter Newman found that, if it were connected to the planned Melbourne Metro rail tunnel, the Doncaster train should attract around 100,000 passengers per day. This is all that the east-west tunnel is planned to take in passenger cars, at a cost of between $5 and $9 billion. By contrast, the cost of the Doncaster rail and its connection to the Melbourne Metro tunnel has been estimated at $1140 million. This Saturday, 23 November, around lunchtime (11.30am-2pm), a group of 15 ghosts from 1888 will be shopping at Westfield Doncaster Shopping Centre. And after they’ve shopped, they are going to politely queue up and wait for their train – and wait – and wait – and wait. For 125 years the good people of Doncaster have been waiting for the promised train to Flinders St Station, and its never arrived. State government after State government has made this promise, only to go back on their word. And now it seems it is the turn of the present State government to cry wolf once more. “Oh yes, yes, trains” they say, but it seems they only have tunnels in their vision. This Saturday, stylishly dressed in period outfits, we will be oh-so-courteously, oh-so-politely and oh-so-patiently reminding shoppers at the Westfield Doncaster just how long it’s been, and how many times this promise has been broken. Enough is enough. It’s time Doncaster got it’s train. Manningham is the only municipality in Melbourne without a train or a tram service. A 2012 study led by Curtin University’s Peter Newman found that if a rail service were connected to the planned Melbourne Metro rail tunnel, the Doncaster train would attract around 100,000 passengers per day. This is all that the east-west tunnel is planned to take in passenger cars. The tunnel is to cost in excess of $8billion – and if it fails, we taxpayers will be picking up the bill for decades to come. By contrast, the cost of the Doncaster rail and its connection to the Melbourne Metro tunnel has been estimated at $1140 million. 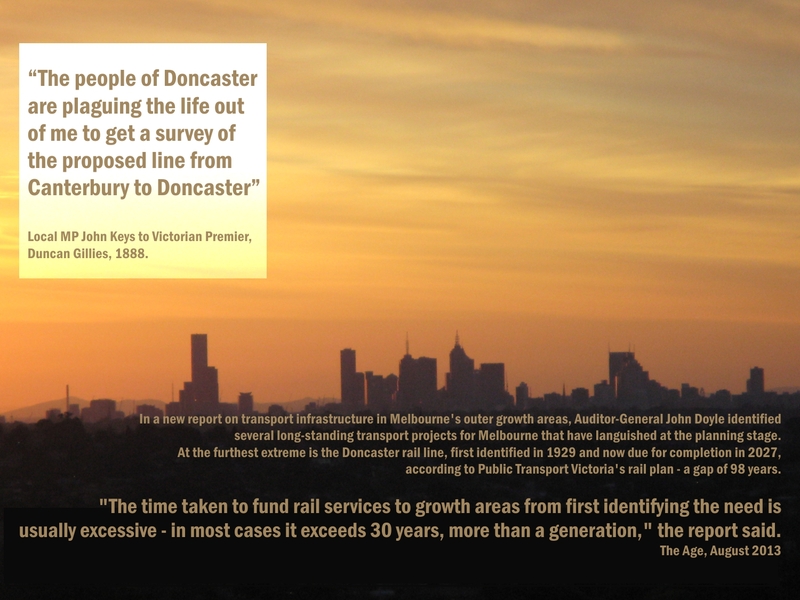 It’s time we supported public transport, for Doncaster, and for all of Melbourne. This Saturday 15 ghosts from 1888 will be shopping at Westfield Doncaster Shopping Centre. After shopping, they will politely queue up and wait for their train – and wait – and wait. The good people of Doncaster have been waiting for 125 years for the promised train to Flinders St Station. It never has arrived! Manningham is the only Melbourne municipality without a train or a tram service. Enough is enough. It’s time Doncaster got its train. Many state governments have re-made this promise, only to go back on their word. Now it is the turn of the present Napthine Coalition state government. This Saturday, stylishly dressed in period outfits, Artists for Trains not Tolls will be oh-so-courteously and patiently reminding shoppers at the Westfield Doncaster just how long it’s been, and how many times this promise has been broken. The 2012 study led by Curtin University’s Peter Newman found a Doncaster rail service connected to the planned Melbourne Metro rail tunnel would attract around 100,000 passengers daily. This is all that the proposed east-west tunnel is to take in passenger cars. The proposed east-west tunnel will cost more than $8 billion. If it fails, the taxpayers will be paying the bill for decades. In contrast, the Doncaster rail connected to the Melbourne Metro tunnel will cost around $1,140 million. “Oh yes, yes, trains, they say, but it seems they only have tunnels in their vision,” said Douglas Horton, spokesperson for Artists for Trains not Tolls. For photos: Press are requested to ring 0421 842 126 on Saturday to find just where within the Doncaster shopping centre in the ghosts are waiting for their train. Photographs will also be made available on request.